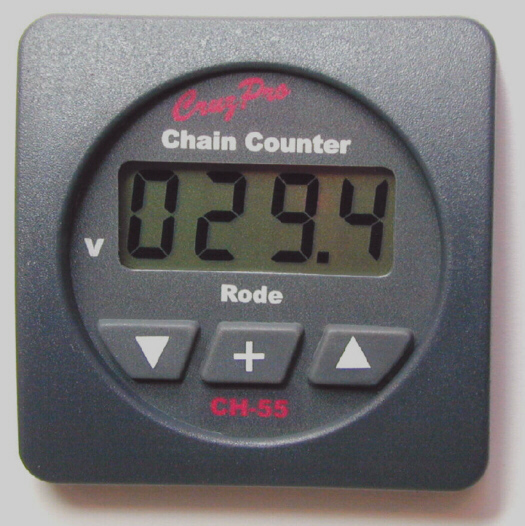 The CH55 is a low cost chain counter that displays how much chain you have let out in feet, meters or fathoms. The CH55 makes anchor retrieval at night much safer. The CH55 can display windlass battery voltage (even under load - when deploying or retrieving the anchor) so you can check the condition of the windlass battery from the helm. The CH55 works over a wide operating voltage range from 6.5 to 33 VDC. With a press of the button you can display deployed rode in Feet, Meters or Fathoms and windlass battery voltage. You can turn off the CH55 and it remembers how much chain you have deployed and displays the correct number when you turn it back on. The CH55 draws only 0.017 amps and 5 levels of backlight (including OFF) can be selected from the front panel.